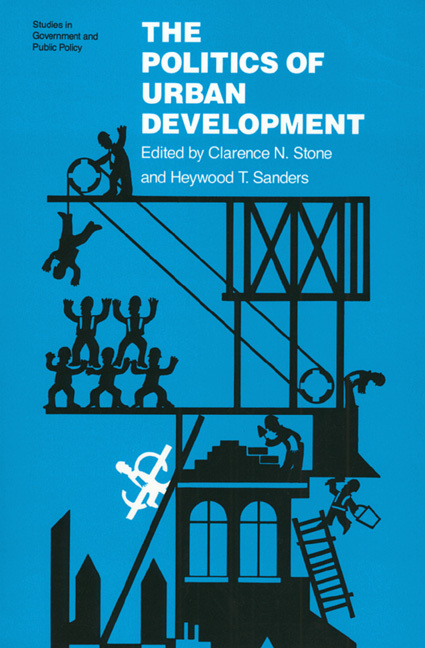 Clarence N. Stone & Heywood T. Sanders, eds. In the past twenty years the study of urban politics has shifted from a predominant concern with political culture and ethos to a preoccupation with political economy, particularly that of urban development. Urban scholars have come to recognize that cities are shaped by forces beyond their boundaries. From that focus have emerged the views that cities are clearly engaged in economic competition; that market processes are shaped by national policy decisions, sometimes intentionally and sometimes inadvertently; and that the costs and benefits of economic growth are unevenly distributed. But what else needs to be said about the policies and politics of urban development? To supplement prevailing theories, The Politics of Urban Development argues that the role of local actors in making development decisions merits closer study. Whatever the structural constraints, politics still matters. Collectively the essays provide ample evidence that local government officials and other community actors do not simply follow the imperatives that derive from the national political economy; they are able to assert a significant degree of influence over the shared destiny of an urban population. The impact of the collection is to heighten awareness of local political practices and of how and why they make a difference.